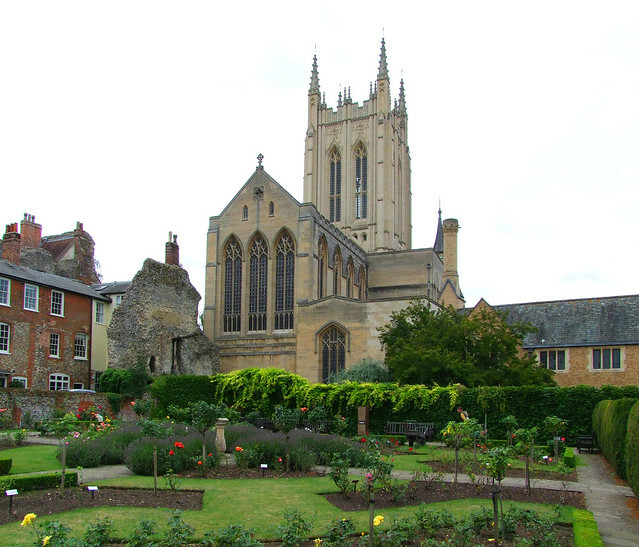 Bury St Edmunds is a smashing little town. 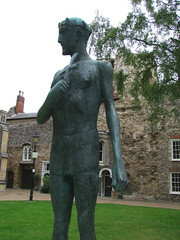 As Pevsner's revising editor James Bettley observes, it is hard to think of a more attractive town of its size in the east of England. Further south and north, Canterbury and Durham are both of a similar size, and are spectacular in their own ways. But Bury's great charm is that it is not spectacular, or even particularly homogenous. Instead, all the architecturally diverse details of the built environment added on over the centuries - the guildhall, the churches, the terraces, the theatres, the brewery, even the 21st Century Arc shopping centre - have been done well, and add something to the greater whole. This is a town of quality. 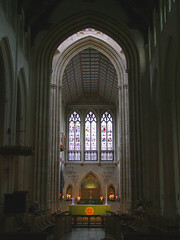 However, Canterbury and Durham both have something that Bury St Edmunds can never have, a great medieval cathedral. And yet, it so nearly did, because the town was home to one of the greatest medieval abbeys in England, Bury Abbey, which you can read about here. 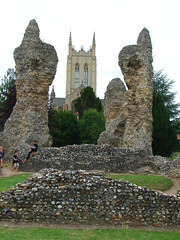 The reasons for the Abbey not acquiring Cathedral status in the Middle Ages were political, an attempt to safeguard its own status and independence that ultimately has left Bury St Edmunds as a town with a hole in it. Instead, the Abbey was demolished, apart from two gateway towers and two of the churches provided for the townsfolk, St Mary and St James. 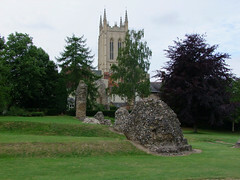 You can still visit the ruins of the great Abbey church, in the gardens behind St James. There is enough remaining to imagine exactly where you are, and if you shut your eyes you can imagine the vast stone space around you. When you open them again, the weathered remains make fantastic shapes, because they consist mainly of the rubble cores of the columns and walls, the stone facing having been removed for building elsewhere. 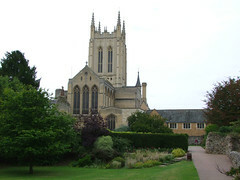 As well as St Mary and St James, there was a third parish church, St Margaret, radiating from the west end of the Abbey. 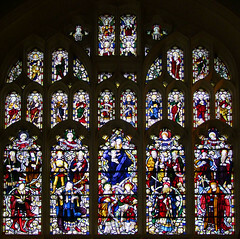 St Mary was by far the most spectacular of the three, the fruit of rich patronage from Bury's wealthy merchants. 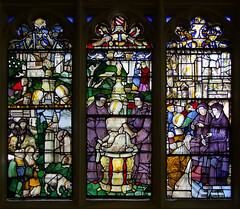 Sam Mortlock imagines the parishioners of St James looking wistfully across the short distance to their neighbours' grandeur, and perhaps it galvanised them into action, because at the end of the 15th Century they embarked upon a Perpendicular rebuilding of their own under the hands of the great John Wastell, who was also doing major rebuildings at Lavenham, Saffron Walden and St Mary's in the centre of Cambridge. Interestingly, Wastell's scheme here did not include a tower. It didn't need to - the bells of St James were rung from the adjacent Norman Abbey gateway tower. 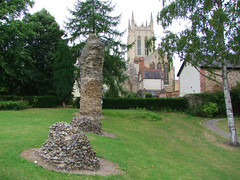 At the Reformation, the Abbey fell - you can read about that elsewhere - and St Margaret was demolished, leaving two large churches to serve the north and south of the town. And so, after the brief skirmish and disruption of the Commonwealth period, the Church of England settled down into its long 18th Century sleep. And then, of course, came the 19th Century revival. 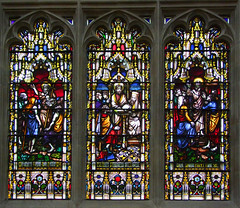 Prosperous Bury St Edmunds was able to comprehensively restore both its major churches, and the restoration here at St James was under the watchful eye of George Gilbert Scott, and the hands of J H Wyatt. 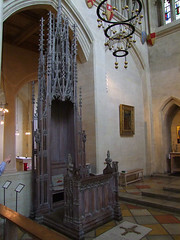 The restoration was more overwhelming than that at the similarly-sized St Mary, and this would have an interesting consequence which we will come to in a moment. 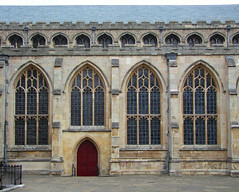 Scott rebuilt the chancel, and the great survival of his work here is the west front, immediately out into busy Angel Hill. This is quite unlike any other church entrance in Suffolk - it is completely urban, and merges totally into the line of the built environment. You step directly out from or into the busy traffic. And then entering this church comes as a delightful surprise. 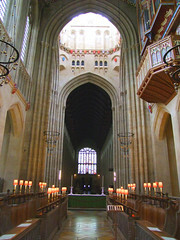 Because of this, however, it is rather hard to form an impression from the outside of the shape or scale of the church; there are grand vistas from the Abbey Gardens, and the hulking ship-like expanse is obvious from north or south, but most first time visitors will have little idea what to expect. 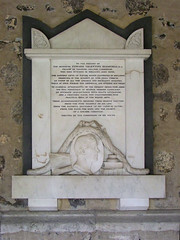 In the early years of the 20th Century, the Church of England was at the apogee of its influence and self-confidence. The time was right to carve up the dioceses of England into smaller patches which could be more easily in touch with their parishes. 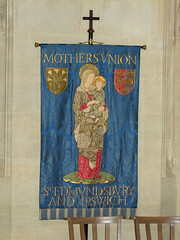 Parts of the Diocese of Norwich and the Diocese of Ely were brought together to form a new diocese which would eventually take the name of the Diocese of St Edmundsbury and Ipswich. And yet it might not have been called that at all. 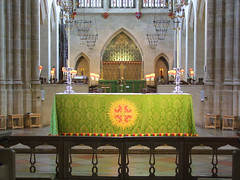 The first task for any of the new Dioceses was to choose a church to become its cathedral. For some this was easy and obvious - Essex's new Diocese would inevitably be seated at St Mary, Chelmsford, and that of south Hampshire at St Thomas, Portsmouth. But the new Suffolk diocese, which would cover all of the county except for the Lowestoft area, had a problem. 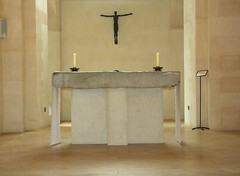 There was no obvious church that stood out as a potential for a new Cathedral. The chosen building had to be big, but it also had to be suitable for expansion; historically important buildings would not lend themselves to being knocked about. 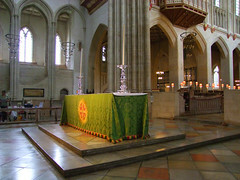 Ipswich had nothing to offer except St Margaret, which was not big enough and too architecturally important for ruthless expansion, and St Mary le Tower which was big enough for a starter, and not historically important; but on too confined a site for expansion, and in any case without the gravitas a cathedral requires. 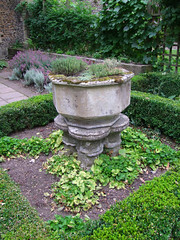 Southwold, which is near to what was at the time believed to be the original Suffolk see at Dunwich, was big enough; but it was too valuable to be extended, and in any case too remote. 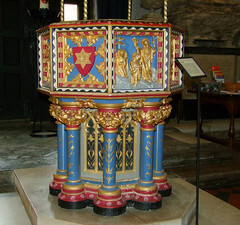 The other great Suffolk churches, Lavenham, Blythburgh, Long Melford, Stoke by Nayland, and so on, were obviously too remote, as well as being too important to touch. 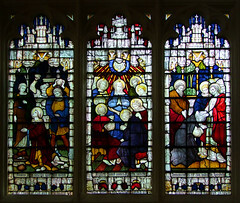 The choice came down to the two Bury St Edmunds churches, and the final choice seems to have been made because St Mary had too many medieval survivals to make extension acceptable. 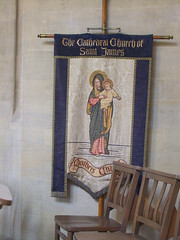 No, only St James would do. The work to turn the parish church of St James into St Edmundsbury Cathedral really got under way in the years after the Second World War. 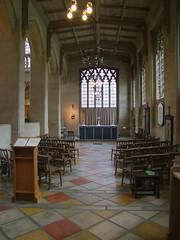 Scott's chancel was demolished in 1963 and replaced by one with wide, spacious aisles and a central choir, with added transepts, all taller than the existing nave. The transepts are the most striking feature of the new work from outside. 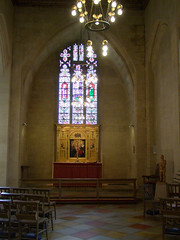 The chancel aisles narrow and then divide into chapels. The result is a feeling of walking into numinous, silent intimacy, a journey that can be traced back to the busy traffic you left outside of the west doors. 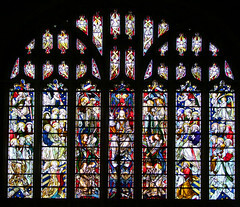 This extraordinary work was the result of the employment in 1945 of Stephen Dykes Bower as Cathedral architect. Dykes Bower is sometimes criticised for being one of the last unreconstructed Gothicists, but increasingly his genius for playing with light and space is being recognised. 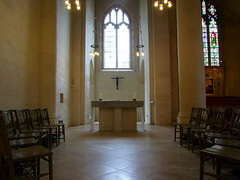 His buildings make use of the massing of internal space to create a sense of size, and then breaking these spaces down into intimate rooms fitting for Anglican worship. Dykes Bower was not just a Gothicist, he was a militant reactionary. 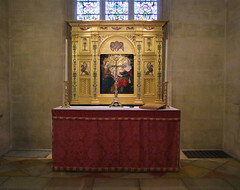 At St Vedast alias Foster in the City of London, his restoration of the blitzed church recreated the feel of a college chapel, ordered for offices and music rather than to the benefit of a congregation. 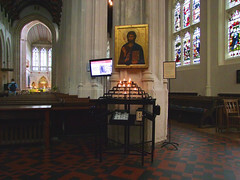 His restoration of St Nicholas in Great Yarmouth, Norfolk, England's biggest parish church, was criticised at the time for having none of the modernist verve or impulse of its contemporary, Sir Basil Spence's similarly-sized Coventry Cathedral (what an opportunity here was lost! 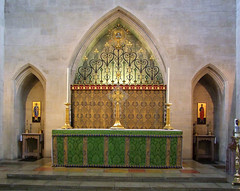 wailed Pevsner hysterically) and his gradual, painstaking restoration of his own little parish church at Quendon in Essex, where he was organist for over fifty years, uses the same palette on a tiny, intimate scale. And, of course, he was right. 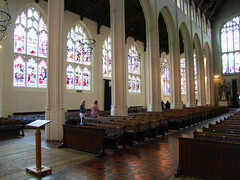 The buildings he has left are entirely suited to modern, contemplative and congregational Anglican worship. They could not possibly be as suited to any other denomination. 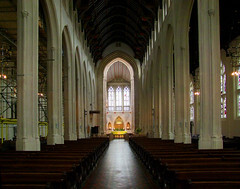 The nave into which you step is still essentially a large, urban Victorian parish church. 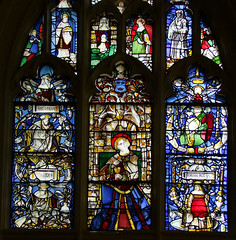 The wide range of glass is by Clayton & Bell, the west window (Wastell's adaptation of his work at Kings College Chapel, Cambridge) is by Hardman & Co, and there is one window of 16th Century French glass depicting the story of Susannah with remains from what must have been an enormous Jesse Tree. 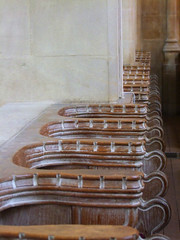 The benches are all 19th Century, not high quality, from Scott's restoration. This huge space takes a back seat - indeed, to mix the metaphors, it visibly takes a step back from everything that happens to the east, for here we have the enormous arch of the crossing, the tallest arch in Suffolk. To either side are the beginnings of those intimate rooms of which I spoke. The bossed ceilures were completed in 2014, and the quality creates a sense of crossing a threshold as we enter either of the transepts. 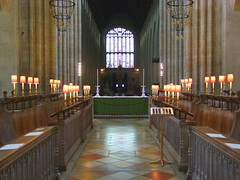 Beyond stands the high altar, but it is not overstated, and does not clumsily outweigh the nave altar in its space beneath the crossing, nor indeed the smaller chapels either side. 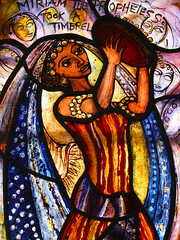 Here, the glass is more impressive, yet still all of the 19th Century. 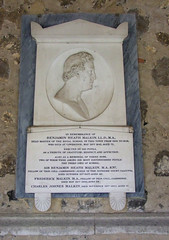 The best is William Warrington's tall sequence of 1847 in the south transept, and the gorgeous 1852 window by William Wailes in one of the north chancel aisle chapels. 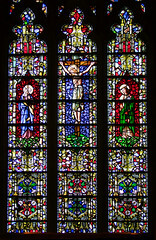 Here, Dykes Bower reset the crucifixion and its attendant figures, breaking up the rest of the window into fragments which are then set jewel-like around the main subjects as if this were a rescued 13th Century window. He knew exactly what he was doing. 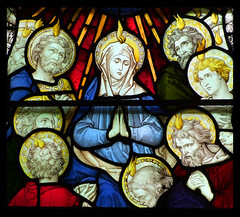 They echo the work of the great stained glass artist Brian Thomas, who Dykes Bower knew well and used for his restorations at St Vedast alias Foster and St Nicholas Great Yarmouth. 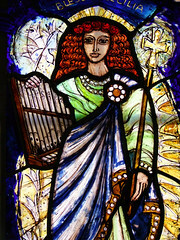 The only glass in the Cathedral which is contemporary with its rebuilding are two lovely panes of 2008 on the stairs to the music school by that finest of all modern East Anglian stained glass artists, Pippa Blackall. 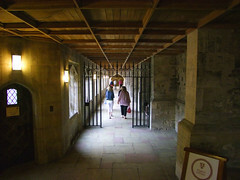 Dykes Bower devoted the rest of his life to this building, and ultimately more than four million pounds of his own money, which was left as a bequest after his death in 1994 to pay for a grand, uncompromising late medieval tower to be built above the crossing. 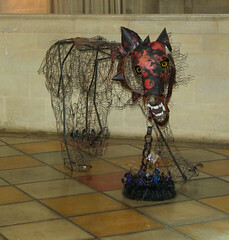 This work was completed in 2005, an extraordinary statement in the early years of the 21st Century. 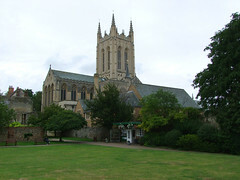 Now, when the Cathedral is seen from the adjacent Abbey Gardens, as in the large photograph at the top of this page, the great tower rears above the flushwork of the tall chancel with its elaborated transepts. It all looks so serious, so permanent, so ancient. It is remarkable to think that not a single stone or brick of what you see was set in place before 1963. The work of building a cathedral never stands still. 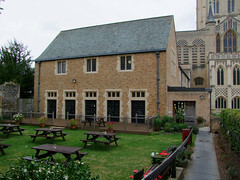 Dykes Bower's cloisters of 1961 lead to the song school and the large Cathedral Centre of 1990. 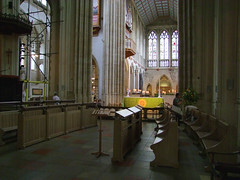 The next step must surely be to address the nave. It would be a simple matter to clear it of 19th Century benches and replace them with modern wooden chairs. 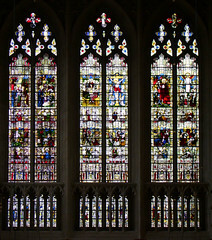 Nothing can be done about the great scheme of 19th Century glass, but this is not as dark a church as its neighbour St Mary, and in any case the nave needs some darkness as a foil to the wonderful mysteries of the east.